ENAR Ireland is a national network of NGOs and community organisations which works at both a National and European level to combat racism. 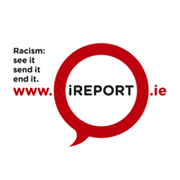 It uses iReport.ie and a range of other measures and instruments to monitor racism, influence debate and make policy recommendations for positive change locally, nationally and in Europe. 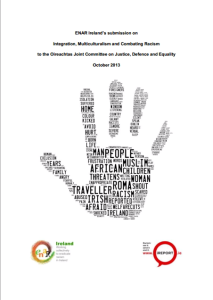 There is currently a policy vacuum on racism and xenophobia in Ireland, at the same time, racism is a far greater problem than is acknowledged. There is not enough data on racism and discrimination, due to under reporting and insufficient resourcing for monitoring. To adequately resource the new Equality and Human Rights Commission to ensure the Human Rights of all minorities. To ensure full State compliance with all EU Directives, UPR, ECRI, UNCERD, Framework Decision and the Good Friday Agreement with regards equality, discrimination and racism.